Sending an international package for the first time is definitely exciting. But, before you can successfully do so, there are some important points that you need to take into consideration: What items can be sent internationally? How long will the delivery take? – And the list goes on. Whether you own a business shipping products overseas or merely sending gifts to your loved ones – there are certain guidelines and restrictions that you should adhere to if you want these items to arrive to their destination, safe and sound. Although you can always count on your courier service provider to take a first-rate care for your package, it’s still your responsibility to ensure that it will not hit a snag in the process. 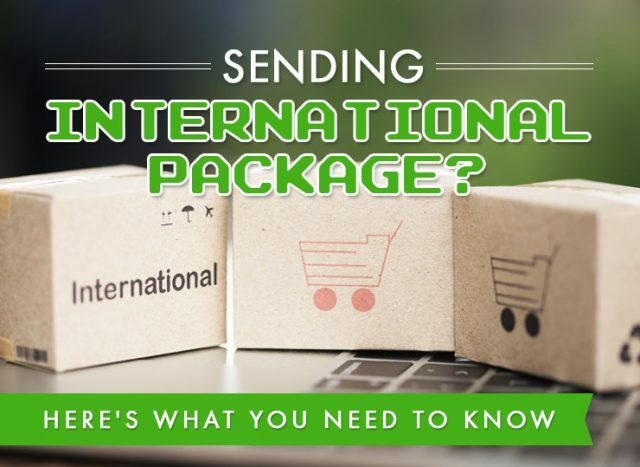 So, to help you, we created this handy guide that lists everything you need to know when sending an international package. Prohibited Items. When sending an international package your first course of action should be identifying whether your courier or the recipient country has restrictions on the item you wish to send. Information on prohibited items can be found on each country’s postal website. Make sure that each item is wrapped individually without any of them touching the inner walls. Fill in spaces with adequate cushioning material to keep items from moving during transit. Size and Weight Allowances. In addition to your own wrappings, most courier service companies provide their own boxes and envelopes in which they base their size and weight allowances. You should know that anything that exceeds these may incur additional charges. Do not use any comma or period. Label the package FRAGILE or PERISHABLE when necessary. Attach sufficient postage to avoid delay of delivery or charges for additional postage. NOTE: Each destination may have specific guidelines for printing the address details. Customs Form. In general, you may need to complete a customs form for all international mails where you will declare the value of the items contained in your parcel. Your recipient may face customs charges that will depend on the declared value. Declared value – when indicating the value of your package, try to make it lower than its actual amount. But still, within a reasonable range. Insured package –when your package is insured, expect that it will most likely be assumed valuable and held at customs. You can read about the benefits of shipping insurance here. Item description – when declaring the items in the package, keep the descriptions as vague as possible. For instance, use toiletries rather than cosmetics. Price tags – when sending new items, remove their price tags and packaging so you can label them as used. Boxes– when mailing several items, try as much as possible to contain them in a big box. Several smaller boxes will cost you more than you might think. A leading eco-friendly courier company in the UK, Green Courier offers international delivery services to almost every country in the world. Our global footprint makes it possible for us to fulfil your deliveries in the most efficient and sustainable manner. For further information, contact Green Courier today. Did you find this information helpful? Let us know by commenting below.